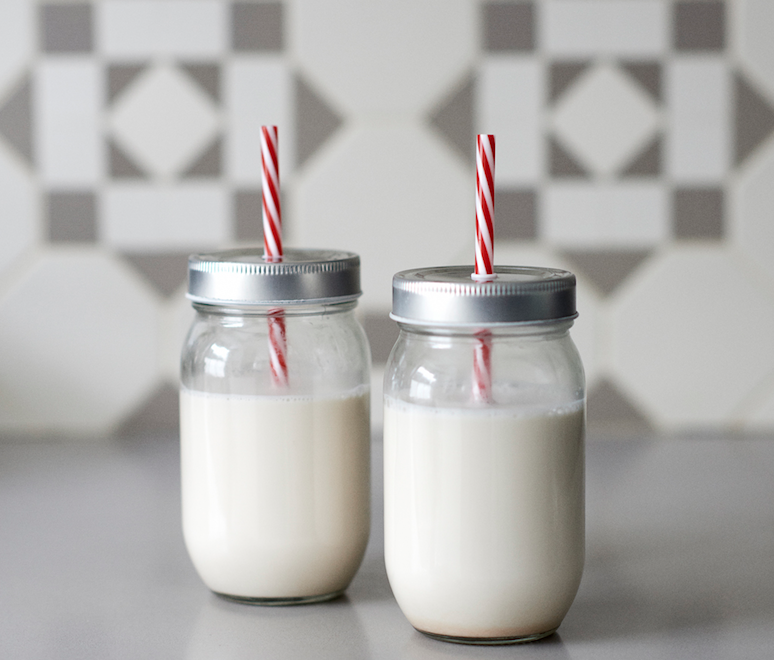 I have to admit, yesterday was the first time I had actually ever made my own almond milk! I drink it most days as the main liquid ingredient in my morning smoothie, but usually I buy it in cartons. A friend of mine gave me a nut milk bag a year ago, and it sat dormant. Thanks to starting this blog, I am more motivated to test new things so I can tell you about them. Now I realize how easy almond milk is to make and how much better it tastes than shop bought, I’ll be making it all the time. Even my six year old likes it! 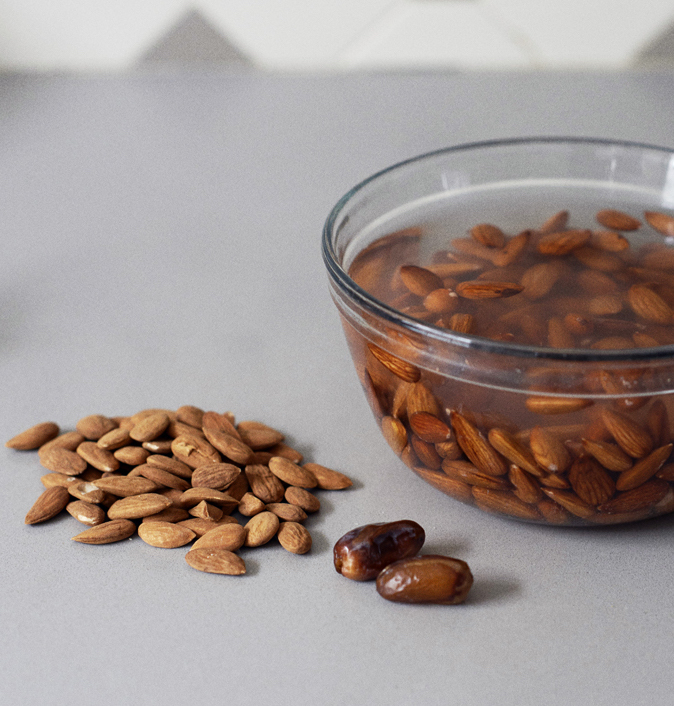 Regularly eating nuts, like almonds, is strongly linked with less heart disease, thanks to their rich content of healthy fats, minerals such as magnesium, vitamins such as vitamin E, plus a host of other bio active plant compounds. To sweeten this slightly, I add two dates, or you can stir in a tablespoon of agave syrup, but you can leave them out if you want unsweetened. Also, for a bit of a change, you can add a teaspoon of vanilla extract. 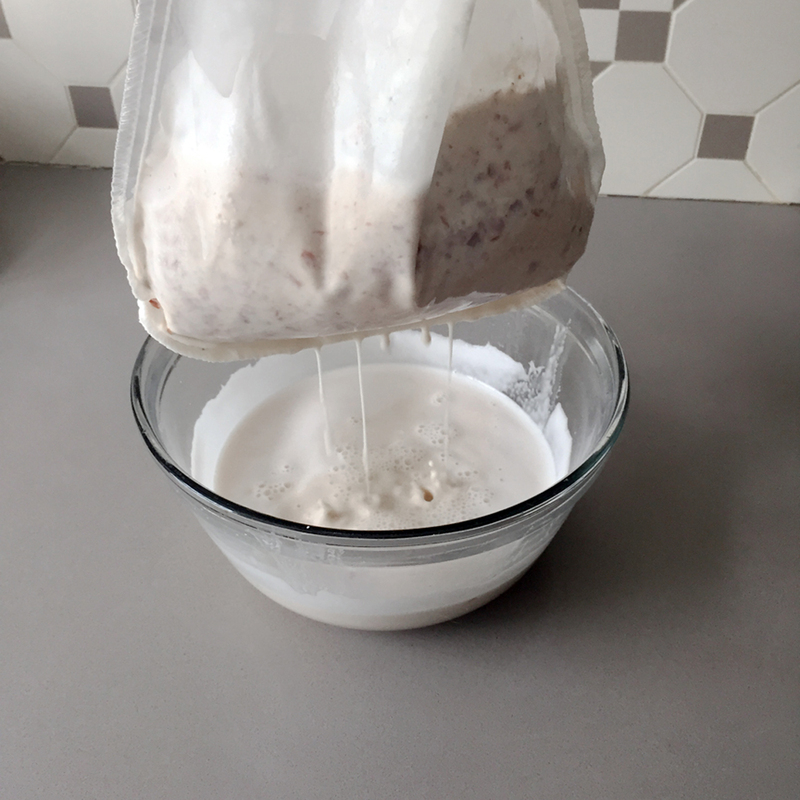 Slowly pour the blended almonds into the nut milk bag or sieve. Lift the bag to allow the milk to run into the bowl. Squeeze until the milk stops dripping out. Pour the almond milk into a bottle and seal. Keeps in the fridge for 2-3 days. Note: The almond pulp left over from making almond milk, is still nutritious and a good source of fibre. It can be used to make an easy, crispy topping for yoghurt and stewed fruit etc. Spread the left over pulp onto a baking tray, drizzle with a little maple syrup and mix well with a fork. Cook for 45 minutes at 180°C/gas mark 4 (350°F), stirring with a fork 2 or 3 times during cooking. Or for a sweet treat, use the left over pulp to make my almond and orange cookies.